Imagine a future in which the sport of boxing has gone high-tech. Human boxers have been replaced by massive humanoid robots. 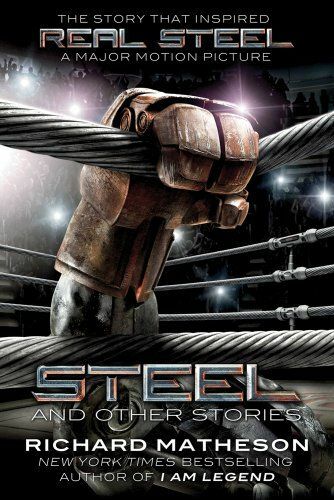 And former champions of flesh-and-blood are obsolete . . . . Richard Matheson's classic short story is now the basis for" Real Steel," a gritty, white-knuckle film starring Hugh Jackman. But "Steel," which was previously filmed as a powerful episode of the original "Twilight Zone" television series, is just one of over a dozen unforgettable tales in this outstanding collection, which includes two new stories that have never appeared in any previous Matheson collection. Also featured is a bizarre satirical fantasy, "The Splendid Source," that was turned into an episode of "The Family Guy. "Richard Matheson was recently inducted into the Science Fiction Hall of Fame. "Steel" demonstrates once again the full range of his legendary imagination.